We are looking to you, our alumni, to support your SIUE School of Business faculty; faculty members give a tremendous gift to their students by helping them achieve their educational goals. Contributing to the School’s Honor Our Past, Build Our Future campaign by giving a gift in honor or memory of an School of Business faculty member who helped mold your future and reach your career goals can make a lasting impact on our faculty and current students. What better way to give back to your alma mater while also thanking someone who has been so vital to your education? 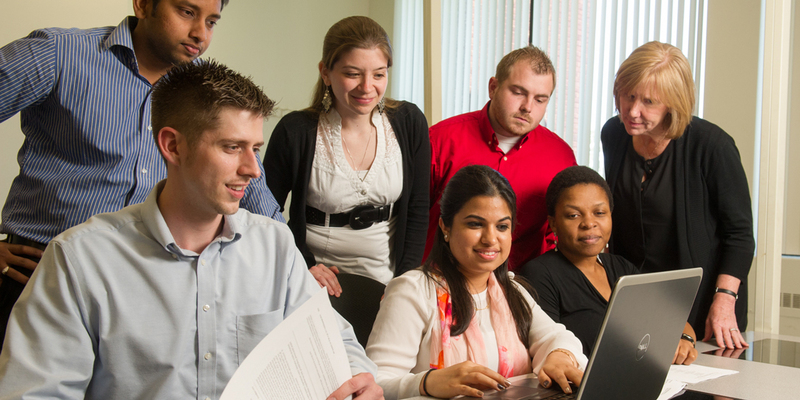 The School of Business faculty has impacted more than 25,000 business alumni to date. Our School and programs are consistently ranked among the best due in large part to the dedication of our faculty. They teach, evaluate and get the job done for our students. We have alumni at some of the highest-level positions at some of the largest global companies. We can put our alumni toe-to-toe with the graduates of other highly regarded business programs and they will come out on top. Today’s faculty must not only discover and impart knowledge; they must also create and support the opportunities that bring that knowledge to life. Faculty support enables the School to attract and retain great teachers while advancing the reputation of its faculty as world-class scholars and professionals. We are looking to you, our alumni, to honor our faculty. They gave you a tremendous gift while you achieved your goals at SIUE. Your gift will benefit our faculty, as well as our current students who will benefit from the faculty’s continued dedication to education. You can make a difference and honor those who have helped you achieve your goals by giving to the School of Business’ Honor Our Past, Build Our Future campaign.